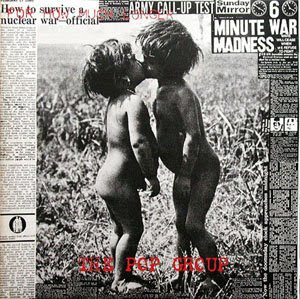 About a year ago, I found a copy of The Pop Group's For How Much Longer Do We Tolerate Mass Murder? on vinyl for a lot less than I thought I'd have to spend. As I've gotten more and more acquainted with the album, (this and 1979's Y), The Pop Group have become one of those near-obsessions for me, the type that outlast any real interest in current music, (though, my latest addiction has been Mission Of Burma's Vs.), and that's led me to look into other funk-post-punk Brit bands like 23 Skidoo, Throbbing Gristle and A Certain Ratio. To bad it isent on CD. I'm not playing Vinyl anymore. A copy of For How Much Longer Do We Tolerate Mass Murder? on CD will squeeze your wallet till it chokes. Plus, the pickin's are pretty slim. GEMM.COM had one copy on CD available: Australian import, $320.